MODECOM FreePC a hand-held, the latest generation mini computer. In case the size of a USB flash drive shut the power and performance of a PC classic. 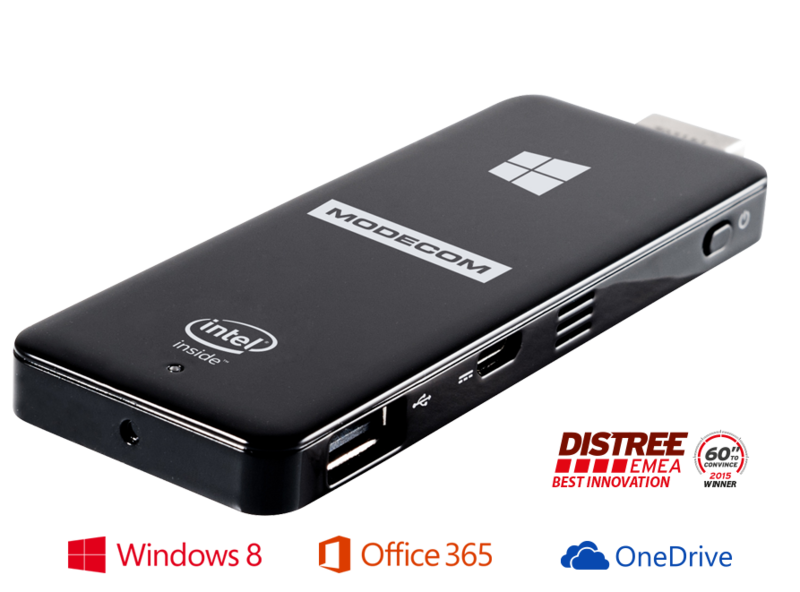 Despite its small size in the construction MODECOM FreePC slumber mighty power Quad-Core Intel® Atom Bay Trail-CR Z3735F, wpieranego by 2GB of RAM and an integrated graphics chip Intel HD graphics.MODECOM FreePC is controlled by the operating system Microsoft Windows 8.1 ™. This renowned system platform with our device makes an incredibly powerful tool for both business and education. MODECOM FreePC will certainly also be used in service shops, restaurants, public places and in all places with limited space. Incredible small, palm-sized construction makes from the MODECOM FreePC ideal solution for home users. Just simply plug it into an available HDMI connector on the TV/monitor, connect it to the power via USB, and after couple of seconds you get an access to the rich world of multimedia entertainment. MODECOM FreePC is an excellent device also for business solutions. Outstanding technical parameters, combined with compact size design makes from MODECOM FreePC ultra- portable device with broad spectrum of possibilities. With HDMI MODECOM FreePC could be connected to both TVs, monitors, projectors, or specialized touch screens. It is a perfect solution for both travelers and office workers. MODECOM FreePC will also could be used in service shops, restaurants, public places and everywhere you like.